a variety of leukemia characterized by an uncontrolled proliferation and conspicuous enlargement of lymphoid tissue in various sites (for example, lymph nodes, spleen, bone marrow, lungs), and the occurrence of increased numbers of cells of the lymphocytic series in the circulating blood and in various tissues and organs; in chronic disease, the cells are adult lymphocytes, whereas conspicuous numbers of lymphoblasts are observed in the more acute syndromes. 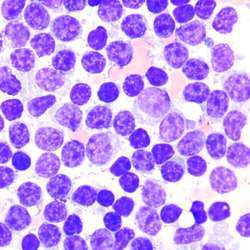 Leukemia characterized by the abnormal accumulation of lymphocytes, especially B cells, occurring mainly in older adults and typically having a slow onset with gradual progression of symptoms such as fatigue and enlarged lymph nodes. a neoplasm of blood-forming tissues, characterized by a proliferation of small, long-lived lymphocytes, chiefly B cells, in bone marrow, blood, liver, and lymphoid organs. CLL is the rarest type of leukemia and the only leukemia to which there is a possible inheritable genetic predisposition. CLL is rare in persons less than 50 years of age, increases in frequency with age, and is more common in men than in women. The disease has an insidious onset and progresses to cause malaise, ready fatigability, anorexia, weight loss, nocturnal sweating, lymphadenopathy, and hepatosplenomegaly. Most patients can continue normal activities for years; 25% die of unrelated diseases. No treatment is curative, but remissions may be induced by chemotherapy or irradiation. See also acute lymphocytic leukemia. Chronic lymphoblastic lymphoma Hematology A slowly progressive form of leukemia more often seen in older adults, which is characterized by ↑ mature lymphocytes Clinical Variable Sx; CLL may be diagnosed fortuitously during a routine CBC for an unrelated illness, before clinical disease Cf Chronic myelocytic leukemia. 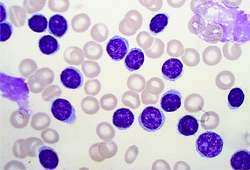 A cancer of the blood cells characterized by large numbers of cancerous, mature white blood cells and enlarged lymph nodes. Elevated Serum Thymidine Kinase Levels Identify a Subgroup at High Risk of Disease Progression in Early, Nonsmoldering Chronic Lymphocytic Leukemia. Identify and understand important and diverse types of therapeutics under development for Relapsed/ Refractory Chronic Lymphocytic Leukemia (CLL). Coverage of the Chronic Lymphocytic Leukemia (CLL) pipeline on the basis of route of administration and molecule type. Pharmaceutical company Karyopharm Therapeutics (NasdaqGS:KPTI) said on Monday that Selinexor has received orphan drug designation from the European Medicines Agency (EMA) for chronic lymphocytic leukemia (CLL) and small lymphocytic lymphoma (SLL), including Richter's Transformation, and for multiple myeloma. USPRwire, Wed Nov 19 2014] Global Markets Direct's, 'Chronic Lymphocytic Leukemia (CLL) - Pipeline Review, H2 2014', provides an overview of the Chronic Lymphocytic Leukemia (CLL)'s therapeutic pipeline. USPRwire, Wed Oct 25 2017] This report provides comprehensive information on the therapeutic development for Refractory Chronic Lymphocytic Leukemia (CLL), complete with comparative analysis at various stages, therapeutics assessment by drug target, mechanism of action (MoA), route of administration (RoA) and molecule type, along with latest updates, and featured news and press releases.